Users' Profiles - Welcome to motu4qc-en! 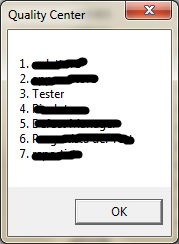 When a User click a button in the Requirements module QC shows the list of Profiles of the connected user. Creation of a custom button on the Requirements toolbar with a "little man" icon that when clicked call a function that returns the Profiles List through a msgbox window. Creation of a Function that returns, in a string variable, the Profiles' List. 'Create of an array splitting the variable on pipe ("||") chars if exist.